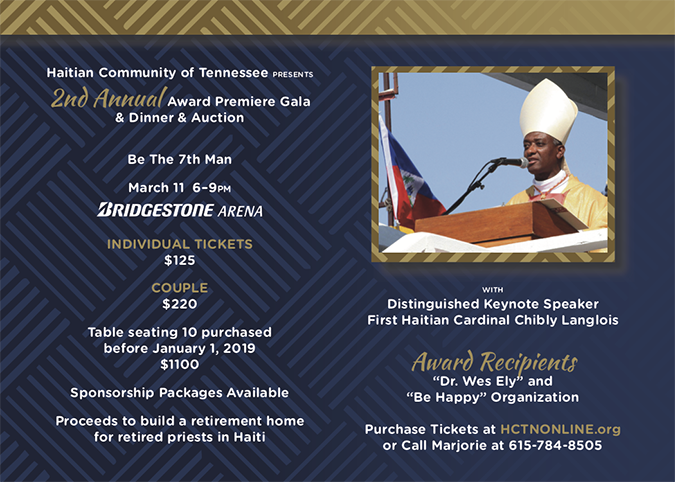 The Haitian Community of Tennessee will hold its second Award Premiere Gala, Dinner & Auction, “Be the 7th Man,” on March 11. The event is set for 6 p.m. at Bridgestone Arena, 501 Broadway, Nashville, TN. The Distinguished Keynote of Speaker for the evening will be His Eminence Chibly Langois, the First Haitian Cardinal, while Dr. Wes Ely M.D., M.P.H.,and Be Happy Organization will be award recipients. Many years ago, Dr. Ely made his first medical trip to Haiti and was captured by the Spirit and needs of its countrymen. As a true 7th Man team member, he returned bringing others with him, including his daughters Blair and Brooke with their friend Emma Hall. This group of young women caught the 7th Man team spirit and brought others along with them forming the organization “Be Happy Haiti” which addresses the dental needs of the people in the area surrounding Jacmel, Haiti. Proceeds of the event will help support the retired priests of Haiti. Priests work without salary. When they retire, they have no income, no home, no accommodation or a pension plan. It is with Cardinal Langlois’s vision and leadership that the needs of retired priests are beginning to be addressed. The evening will begin with a cocktail reception where guests will have a chance to mingle and bid on silent auction items. The cocktail reception will be followed by dinner and presentation of a Philanthropic Award. You may follow on Facebook at facebook.com/HCTNONLINE; on Twitter at twitter.com/HaitianTNOnline; and on Instagram at instagram.com/haitian_community_tn.